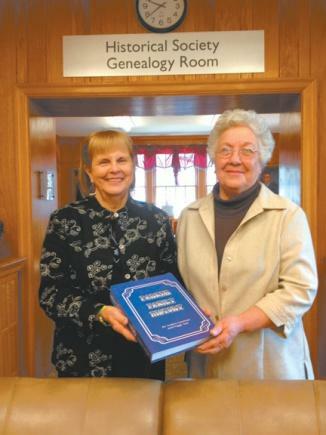 Peggy Tate, left and Audrey Cawthorn proudly display the Parker Family History book that is available for $75.00 from the Adams Memorial Library. Parker Family After more than two years of research and fact checking, a 600-page History of the Parker family and relations has gone to the publishers and will be available soon. The book features a complete index of all names that appear in the book as well as more than 100 photographs of various Parker family members and events, some dating back into the 19th century. Two devoted Cannon County genealogists, Audrey Rogers Cawthorn and Peggy Wilson Tate spent untold hours searching for names and dates and how certain Parker families and relations connected, to make this book an outstanding source of authentic information for those interested in researching family lineage and history. Audrey and Peggy were classmates at Woodbury Central High School and renewed their friendship after Peggy returned to Cannon County after living in Indiana for thirty years. Previously Audrey and Peggy have researched other family histories including the Rogers, Holt, Murphy and Goad families. Results of their work is part of an extensive collection of family histories in the Genealogy Room at Adams Memorial Library in Woodbury where Peggy is a volunteer genealogist on Thursdays from 9 to 3 each week. They have agreed to give all of the profits from the sale of this book to the genealogy room as part of the extensive expansion/renovation project being completed at the library. Copies of the 600-page Parker Family History book may be reserved at a special pre-publication price of $75 (plus shipping and handling cost of $7). When the book is published in a few weeks the price will be $90. To order copies of the book, send check payable to Adams Library Genealogy Room, 212 College St., Woodbury, TN 37190, or see Peggy Tate or Audrey Cawthorn.